On Monday, St. Joseph’s University Parish held a panel on how Catholics and the Diocese can move forward after the sexual abuse scandal. The Roman Catholic Church is in the midst of a sexual assault crisis which has affected Catholics around the world and right in Buffalo. Monsignor Patrick Keleher of UB’s Newman Center does not want Catholic students to lose faith, despite the reemergence of a 17-year sexual abuse scandal that has again rocked the Catholic Church. He’s been in the church for half a century and knows worshippers in the Buffalo Diocese, which has in the past year been consumed with a new string of abuse accusations and calls by prominent Catholics for Bishop Richard Malone to resign. He knows Catholics worldwide are undergoing a crisis of faith. But Keleher believes the 2,000-year-old Catholic Church will find its strength again. UB’s Catholic community wants to bring believers together to help them maintain their faith and discuss how the church can change moving forward so such acts won’t happen again, local religious leaders told The Spectrum. Community churches like the Newman Center and the St. Joseph University Parish near South Campus are coming to terms with the abuse scandal through forums and discussions, as priests are opening their doors and listening to students’ and community members’ concerns. This year, the Buffalo Diocese was revealed to have helped hide dozens of child sexual abuse accusations against priests, according to reports by The Buffalo News and WKBW-TV (Channel 7). Malone, the leader of the diocese, reportedly knew about sexual abuse cases involving priests in Western New York but allowed them to remain in ministry.Malone and the Buffalo Diocese released a list of 42 “credibly accused” priests, but the number of accused priests was later revealed to be 100. Buffalo isn’t the only place where the scandal, which first came to light in 2002 after reporting by The Boston Globe, has reemerged. In August, a Pennsylvania grand jury found Pennsylvania’s Roman Catholic Church covered up child sexual abuse. The grand jury report named more than 300 priests over a 70-year period, according to The New York Times. Washington, D.C.’s Cardinal Donald Wuerl also resigned this year amid criticism of how he handled abuse complaints. The Globe’s 2002 reporting, which won the Pulitzer Prize for public service and was the subject of the Academy Award-winning film “Spotlight,” detailed multiple instances of sexual abuse by priests in the Boston Diocese. The report showed wrongdoing in the handling of accused priests by high-ranking members of the Boston and Roman Catholic Diocese and led to more accusations against the church surfacing around the world. Most UB Catholic community members interviewed by The Spectrum said there needs to be change within the church. Keleher, known as Father Pat, is the campus minister at the Newman Center in addition to his duties as director. In the past few months, community churches have hosted forums to discuss the Catholic Church’s abuse scandal, and on Oct. 15, the Newman Center hosted one such discussion. Keleher said he was moved by the honesty of his ministry members at the forum. Keleher said openness is an important part of the church’s healing process. As churches in the diocese grapple with the scandal, other worshippers have connected it to other power dynamics in the church. Roy Bourgeois, a former priest who did missionary work with the Maryknoll Fathers and Brothers, spoke Sunday at UB’s Center For Tomorrow to 80 Buffalo community members about ordination of women in the church. Bourgeois said the scandal is due to the patriarchal structure of the Catholic Church. Bourgeois said the letter was “ironic” in light of Catholic Church leaders transferring priests who were accused of sexual abuse. He said bishops transfer priests to avoid “scandal in the church,” which has created the worst crisis he has ever seen in the church and tested devout Catholics’ trust in their leaders. St. Joseph, the campus ministry for UB students near South Campus, held a panel Monday on how Catholics and the diocese can move forward after the scandal. Roughly 100 community members attended the event. The panel featured Buffalo Diocese members, local Catholic university staff members and local Catholic journalists. Panelists and audience members said they support sexual abuse victims, more transparency, allowing priests to be married and larger roles for women in the church. Audience members said the panel format was not the best choice for the event, comparing it to a St. Joseph open discussion forum event held in September. Audience members had different opinions on Bishop Malone still holding his position. One audience member said the Buffalo Diocese should remove Malone. Roughly 50 people applauded and agreed with the statement. Jakubowicz said the panel’s purpose was to respond to a “hurting” community. Known as Father Greg, Jakubowicz said the Catholic Church must make an effort to restore trust. Jakubowicz said St. Joseph will continue to run events similar to the one held Monday. Andrew Mattle, Mark Mattle’s brother and a member at St. Joseph, said they each have children who go to UB and “do not have much interest” in being Catholics. Mattle said the panel asked how many attendees were under 40 years old. Only two people raised their hands, he said. Community members aged 40 and over talked to The Spectrum at the St. Joseph panel. Most students, however, did not. In a span of 30 minutes, The Spectrum tried to interview 50 students, but only two felt comfortable talking about the scandal. Most students declined to comment or did not know enough about the scandal to comment on it. Elizabeth Vennari, a senior economics and music major, said Bishop Malone helped her and her family as they planned her father's funeral two years ago. “It’s hard to see the people who have done good things for you, that have reached out to you in a personal, humanitarian way, come to light as someone who’s covered up these really awful things," Venarri said. Still, Vennari said she doesn't want Catholics to be afraid of the church. She said this is an opportunity for the Catholic Church to be more vocal about what is wrong with the leadership. Isabella Nurt contributed reporting to this story. 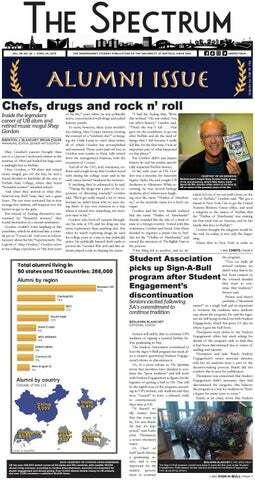 Benjamin Blanchet, Jacklyn Walters and Thomas Zafonte are editors and can be reached at features@ubspectrum.com. Thomas Zafonte is a senior English major. He is a UB sports fan and enjoys traveling around Buffalo.